Lincoln Manufacturing was founded in 1972. Since then, we have been providing our customers with the service, quality, and peace of mind you would expect from a manufacturing facility such as ours. We are located off I-79 near the I-70 / I-79 junction, in a 65,000 square foot State of the Art facility with a complete line of CNC equipment and technology. 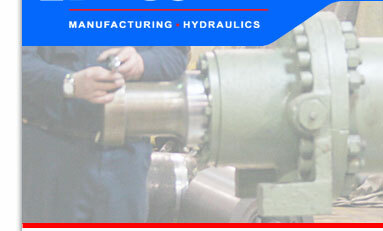 Our services include manufacturing and repairing items such as rolls, shafts, bearing housings, hydraulic cylinders, and more. Over the years, Lincoln Manufacturing has earned a solid reputation for high quality repair and manufacture of cylinders, as well as the design of new cylinders and spare parts. We specialize in serving the mining and steel making industries. Our expertise spans from producing equipment for longwall and continuous mining operations to the production and maintenance of rotary, chock and other heavy-duty cylinder components. 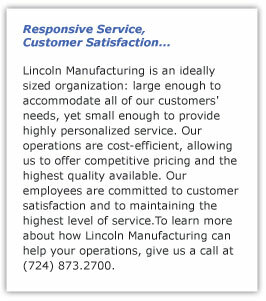 Your Quality is assured at Lincoln Manufacturing. All equipment processed at our facility is thoroughly inspected, calibrated, and load tested to perform to the standards of your operation needs if not exceed them.